Many of us are earnestly hoping that this rumor is true, and that the studio in Glendale is also enjoying the presence of Hazel and Berman to shoot another infomercial in the Magic Bullet line. I am certain that Mick Hastie’s efforts will do much to wipe out the memory of the miserable Nutribullet ad and bring the Magic Bullet infomercial franchise back to its former glory! 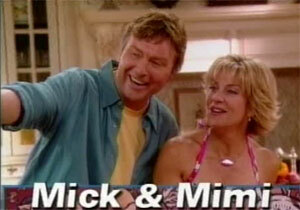 Does Anyone Have the Red Devil Grill Infomercial Hosted by Mick and Mimi? It’s going to be hard to top Magic Bullet To Go, the Empire Strikes Back of infomercials. Still, if this is a new Magic Bullet infomercial, I can’t wait to see it. He’s working with a new woman named Stephanie for a Dessert Bullet. Thanks for the heads up, James. Will check out the Dessert Bullet.